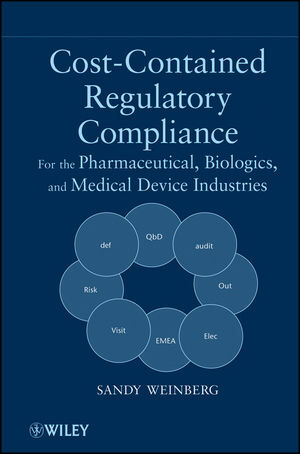 This book guides the reader through FDA regulation guidelines and outlines a comprehensive strategy for cost reduction in regulatory affairs and compliance. This book explains six strategies to cost-effectively comply with FDA regulations while maintaining product safety and improving public access through cost controls. It provides useful and practical guidance through industry case studies from pharmaceutical, biotech, and medical device industries. SANDY WEINBERG, PhD, is a professor of healthcare management at Clayton State University in Atlanta and an international regulatory consultant. He has thirty-five years' regulatory experience, including global executive responsibility at GE Healthcare and Tikvah Therapeutics. Dr. Weinberg has written thirteen books including, most recently, Guidebook for Drug Regulatory Submissions, also from Wiley. Chapter 1. Controlling Regulatory Costs. Chapter 2. Clear Operation Definitions of Requirements. Chapter 4. Quality by Design. Chapter 8. Managing FDA Inspections. Chapter 11. Cost Containment Analysis. Chapter 12. Managing Regulation In Times of Chaos. Chapter 14. Cost Contained Regulatory Compliance.